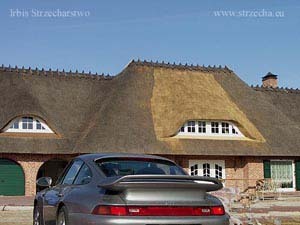 We make thatch for the most demanding customers, ensuring their unique aesthetics. We guarantee excellent insulation coverage, durability and safety! Thatch is a natural roof cover and our specialty. 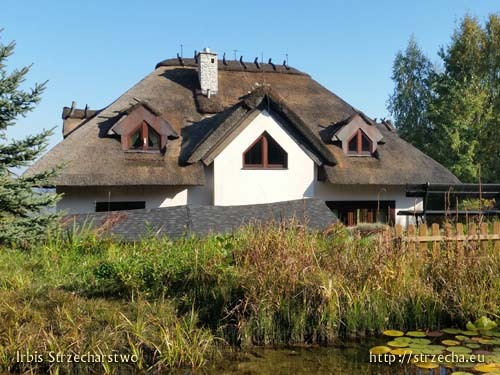 Thatch reed realized on new buildings, but also straw thatch or replacement of old thatched roofs and all work related to the thatched roof - a reed roof! 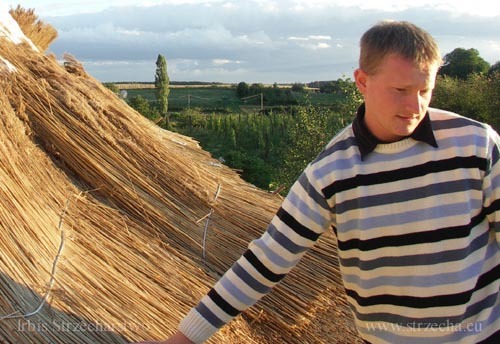 The need to replace thatch occurs when the distribution of reed or straw discovers bonds! 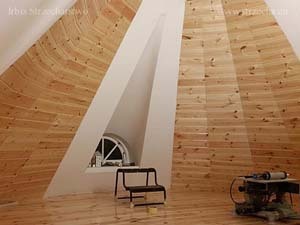 This is tantamount to leaking rainfall to the inside and destruction of the wooden roof structure! Warranty and post-warranty: fire protection, moss cleaning, reed compaction, ridge replacement, wind-up repairs, additional window openings, roof remodeling, chimney repairs, etc. 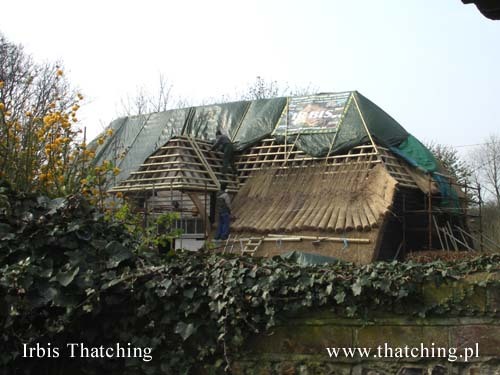 Thatch requires a properly designed wooden structure! We are able to make the construction meet the required technical parameters, along with the aesthetics suited to the architectural style. 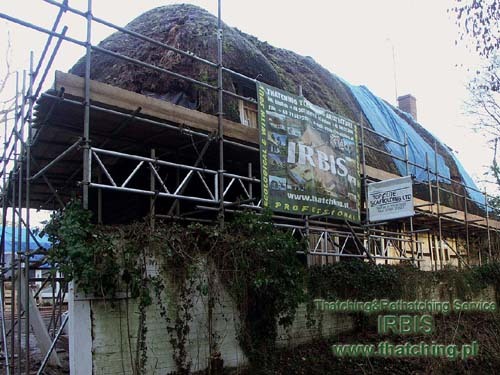 We are at your disposal to solve any issues related to the implementation, or service of thatched reed or straw. The family tradition of our company is a guarantee of your success, when you face the challenge of the most beautiful roof of reeds or straw! 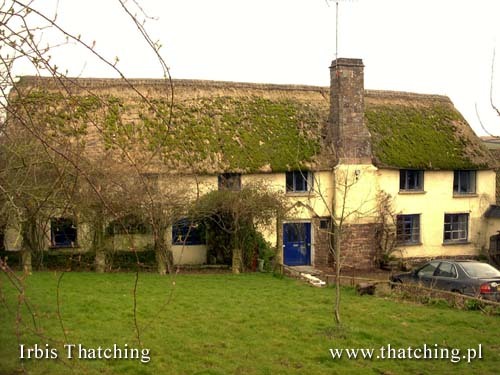 Thatching is my passion. 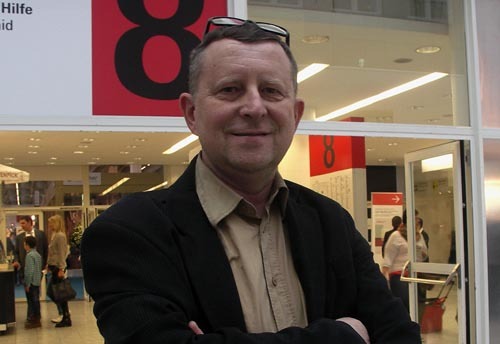 For years, I have been extending my knowledge in different countries, adopting the best solutions. Do you have a question? 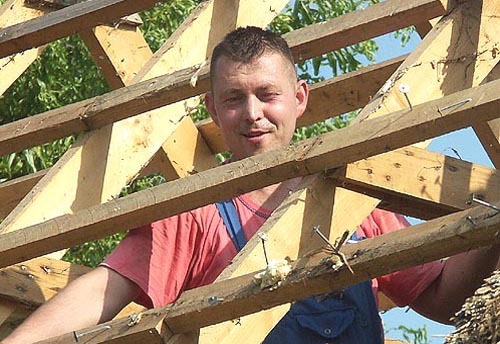 The reed roof is a problem for you? Maybe you are looking for remarkable solutions, which is a reed thatch? Contact us using the form below - we will answer as soon as possible! Thatch on the roof, it is undoubtedly a view that is not common! The use of such a cover adds not only charm, but also prestige - a house under thatched roofs determines the unquestionable high social status of its inhabitants, organizes the next and the next space anew, it becomes often a landmark that can not be overlooked! A well-deserved estimate can also become a source of problems - in fact, I come across this problem more and more often. So often, I decided to write a few words about it here. Let's think together: will we risk it if we implement an investment that will have a significant impact on our lives? Roofs of reeds ... - I really do not like this measure! It is associated with a hut of prehistoric homo sapiens, on which the reed was laid without any technical culture. 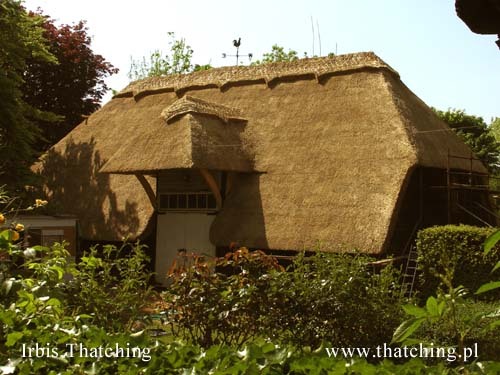 Thatch is not only the finesse of shape, but above all the traditional way of building! 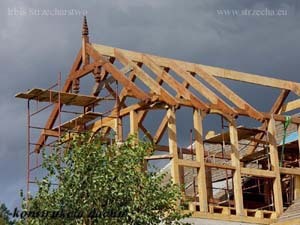 To think that roofs are still in progress, the age of which is estimated for several hundred years and their technical condition fulfills its function. During the renovation of old thatch I feel like a lesson given by ancient masters. I use my experience during the implementation of contemporary roofing, always trying to build in harmony with nature and local tradition. A thatched roof and what next! 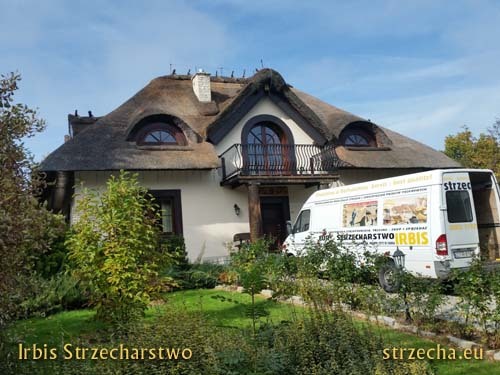 Thatching - Respect for traditional technologies means that in Europe thatch roofing is practiced on virtually all types of buildings: from modern temples to modern, rustic houses in the countryside. Between there is a place for thatched multi-family buildings, multi-storey blocks of flats or public facilities. The tradition of living is not only comfortable but also beautiful - but we can not forget that it is not a cover for everyone! 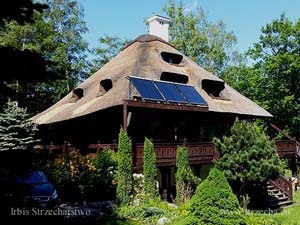 In the implementation of thatched roofing, the building must be designed "for the roofs", which is associated with many conditions, such as: appropriate cross-sections of timber construction elements or a special chimney design. First of all, the roof should have adequate inclination angles, ensuring good drainage of rainwater. 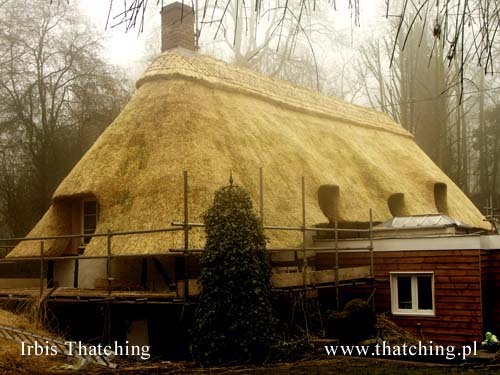 It is the basic condition that the thatch survives the assumed 50-100 years! A thatched roof in England! ·	1991 year of establishment. 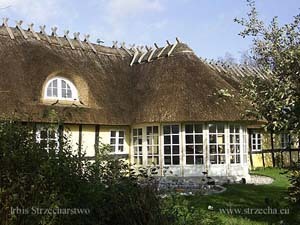 ·	2003 year, April - the first foreign contract to cover thatched roofs in Belgium. 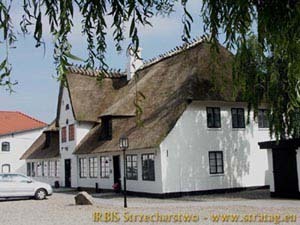 ·	2005 year - Denmark, Rinkenaes - before the visit of His Royal Highness, we restored the splendor of the residence with the restoration of the former cover that was the thatched roof - the building was given the title "Pearl of Danish Architecture"! In the year 2016 We celebrated 25 years of the company's existence. 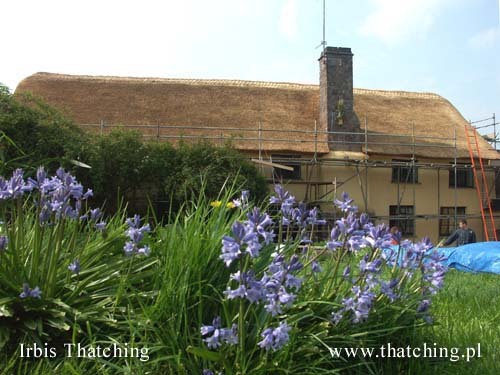 Thatching is our passion, from generation to generation!